‘Police, Adjective’, by Corneliu Porumboiu, in the presence of the director. This being now said, dearest friends, a great weight is lifted off our collective chest. We were literally burning to share this piece of information with you, and were afraid, being so hot, the news might have burned a hole through our hard drives. Please make a special note of these dates in your agendas. More details to follow soon – so watch this space! In case you are not that familiar with our venture in promoting Romanian film, here is a brief introduction: In 2003, with the need for a major event showcasing Romanian cinema in the UK becoming more and more apparent, with the quality of the films and their impact growing ever greater and greater, we decided to meet the challenge, and, in October 2003, we opened the first edition of the Romanian Film Festival - also the first ever festival in the UK dedicated to Romanian film. The years have passed, Romanian cinema has broken new ground and garnered international acclaim, and our Festival has now reached its seventh edition. 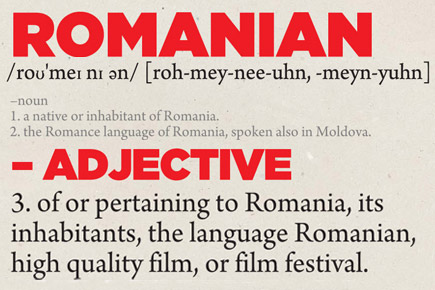 We present annually the best of new Romanian cinema and rediscovered classics. We do not neglect the greats of our cinematography, nor the pictures that have gained eternal cult status. Inspired by the strength of the Romanian New Wave, we have brought you the hottest and top prize-winning productions and have introduced to you the ones to watch for the future. We have also taken into consideration the educational side of our Festival, so from the very first edition we brought very special guests, directors, producers and actors to London to take part in Q&A sessions and meetings with the audience. They will be here again this year. Expect the same and more from the 2010 edition of the Romanian Film Festival in London. Stay tuned, and spread the news! Curzon Cinemas, and Artificial Eye.